New research from The University of Texas at Austin adds new evidence to a theory that claims the metallic cores of rocky planets like Earth were formed when molten metal trapped between grains of silicate rock percolated to the center of the planet during its early formation. UT Austin. Scientists have long pondered how rocky bodies in the solar system—including our own Earth—got their metal cores. 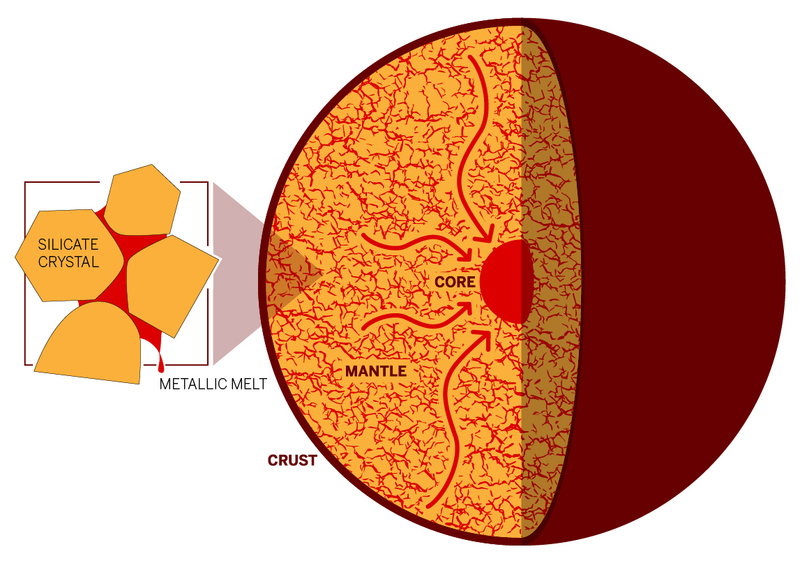 According to research conducted by The University of Texas at Austin, evidence points to the downwards percolation of molten metal toward the center of the planet through tiny channels between grains of rock. The research was published on Dec. 4 in the Proceedings of the National Academy of Sciences. The work was the doctoral thesis of Soheil Ghanbarzadeh, who earned his Ph.D. while a student in the UT Department of Petroleum and Geosystems Engineering (now the Hildebrand Department of Petroleum and Geosystems Engineering). He currently works as a reservoir engineer with BP America. Soheil was jointly advised by Hesse and Maša Prodanović, an associate professor in the Hildebrand Department and a co-author. In this study, Ghanbarzadeh developed a computer model to simulate the distribution of molten iron between rock grains as porosity, or melt fraction, increased or decreased. The simulations were performed at the Texas Advanced Computing Center. Researchers found that once the metal starts to flow, it can continue flowing even as the melt fraction decreases significantly. This is in contrast to previous simulations that found that once the metal starts flowing, it only takes a small dip in the volume of melt for percolation to stop. Images of melt networks in irregular grains (a) used in a study by The University of Texas at Austin and melt networks in regular grains (b) used in previous studies. Their simulations show that irregularity of grains promotes connectivity of the melt. UT Austin. The effort paid off because researchers found that the geometry has a strong effect on melt connectivity. In the irregular grains, the melt channels vary in width, and the largest ones remain connected even as most of the metal drains away.